I told the kind folks in #ubuntu-doc that I'd give it go, writing up some documentation for Unity. Here's a first draft of my best effort. I'm hopeful that the real pros at this can mine this material for making nice official documentation. I'm hoping that thay can cut and paste from here into their docs, or at least can edit the content to something they like, but maybe get going a little faster since there is something to change, rather than having to start fresh. 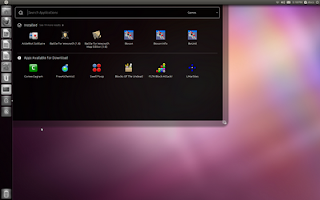 The Unity environment has four areas that, combined, allow full operation of Ubuntu. The Application Area. This is the main area of the screen for applications and documents. Indicators. Indicators run along the panel at the top of the screen, off to the right Indicators are persistent widgets that are always available for reference and Controlling Ubuntu. Indicators include functionality for things like networking, power, messaging, time, and managing a session. The Launcher. This provides access to favorite applications and running applications. The Dash (not shown). 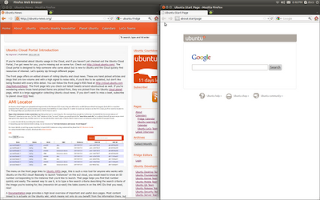 The Dash provides very fast access to applications and files via searching or browsing. The Dash can also be customized with new "lenses" to allow other types of searching. 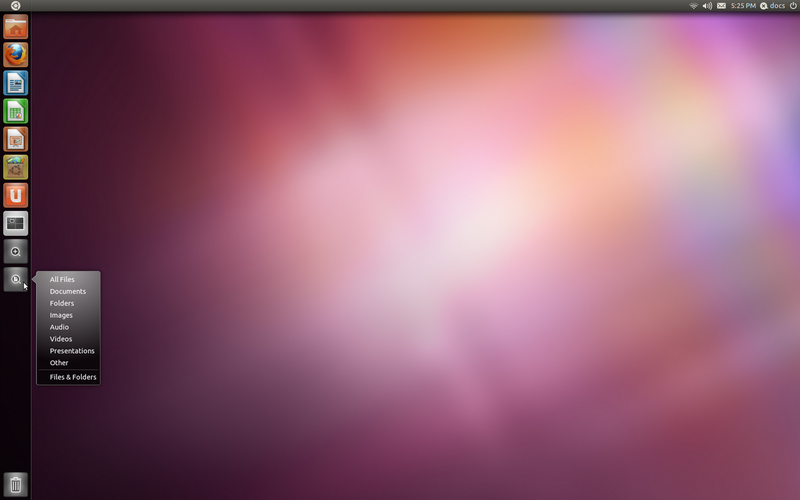 If the icon for the desired application is on the launcher, you can simply click on the icon, and it will launch the application. If the application is already running, clicking on the icon will activate the running application and bring it to the front. For example, if you click the Firefox icon on the launcher, this will launch Firefox, unless a Firefox window is already open, in which case Firefox will be brought to the front. 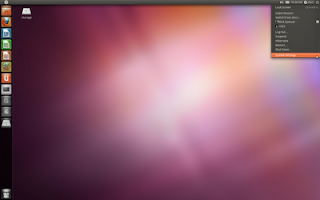 After launching an application, The Launcher, my "autohide" by sliding off the screen to the left. If this happens, it can be easily accessed by pointing the mouse all the way to the of the screen and waiting for the launcher to appear, or pointing to the top left corner of a screen will cause the launcher to appear instantly. 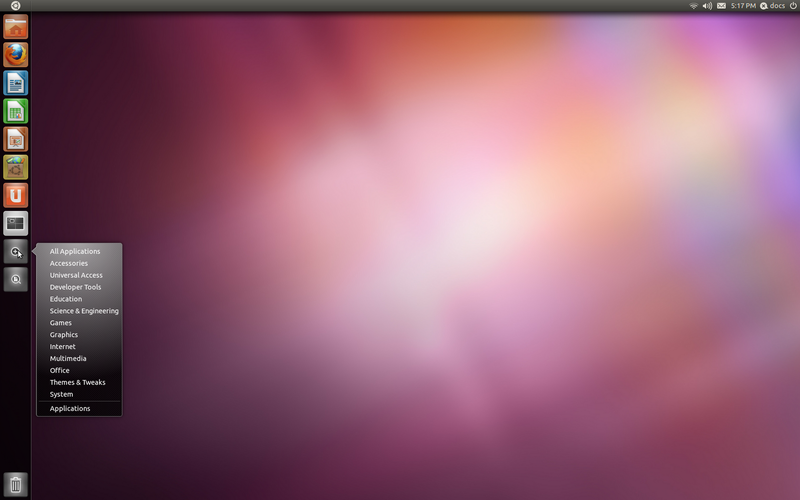 Running applications will have one tickmark to the left of the icon for each Window that is open. 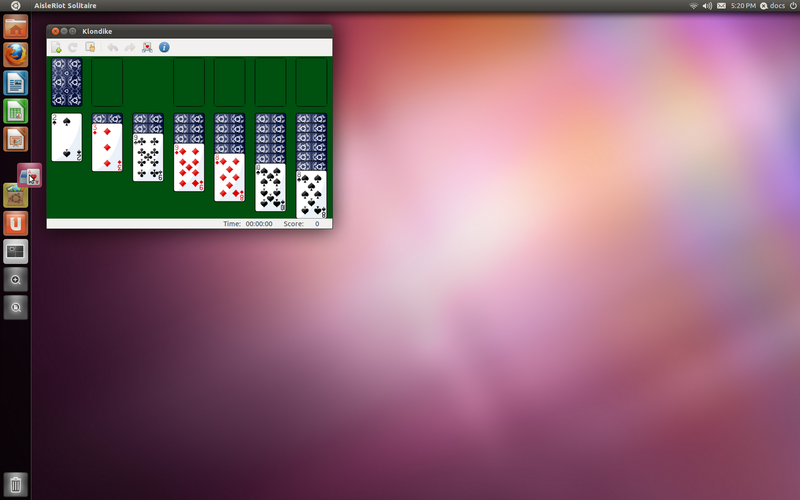 In this way, it is possible to see how many windows are open for an application. Clicking on an icon with the middle mouse button will open a new window for a running application. Some applications also support open a new window via a "Quick List". Right clicking on an icon will reveal the Quick List for the application. 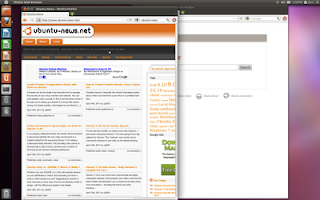 For example, Firefox has a "Open New Window" option in the Firefox Quick List. The Launcher can also be used via the keyboard, without the mouse. In order to activate an icon on The Launcher, press and hold the meta key on the keyboard (for example, on computers that came with Windows installed, there may be a Windows logo to mark the meta key). Pressing and holding the meta key will cause The Launcher to open, and each icon on The Launcher will be marked with a number or letter. Clicking the keyboard key with the number or letter that corresponds to the desired icon while still holding down the meta key will activate that icon. Holding down the shift key as well while doing so will launch another instance of the application, similar in function to middle clicking with the mouse. 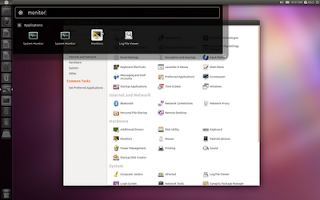 The Dash is activated by clicking on the Ubuntu logo in the top left of the screen, or by tapping on the meta key. When The Dash is activated in this way, it defaults to the Global Search lens. Commonly used applications and application categories are available by default. The Global Search lens searches files as well as applications, so files can be quickly accessed in the same manner. To quickly activate an application, typing the first few letters of an application will show the application's icon, which can then be clicked to activate. Alternatively, typing the Enter key on the keyboard will cause the first item in the list to be activated. In this way, an application can be run very quickly by tapping the meta key, typing the first few letters of the applications name, and pressing Enter. Any of these section can be expanded by clicking the "See more results" link. 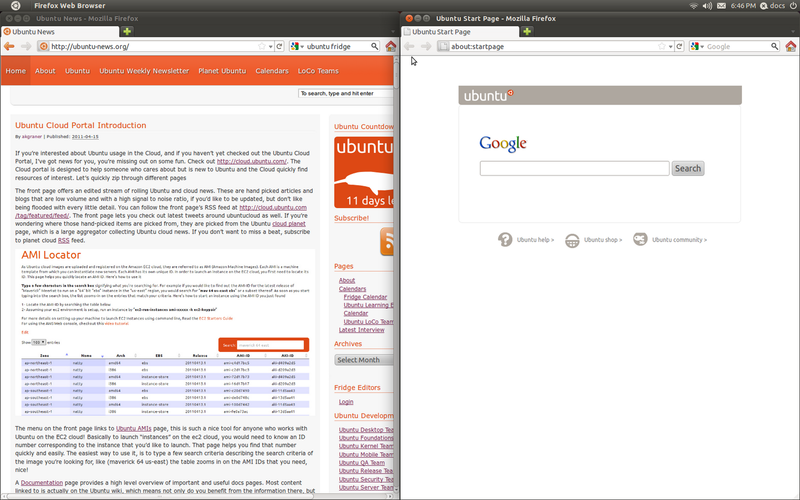 For example, clicking "See more results" on installed applications will show all installed applications. To limit the displayed applications to a category of applications, a category can be selected via the category selection dropdown. The Quick List for the Application Lens allowss fast access to an application category. Choosing one, will open The Dash and disply the selected category. An application can be added to the launcher by dragging the application's icon from The Dash onto the launcher. Alternatively, when an application is running, the Keep in Launcher item in the application's Quick List will permamently add the application to The Launcher. Once on The Laucher, an icon's position on The Launcher can be changed by dragging it first off of The Launcher, and then back onto it in the desired location. 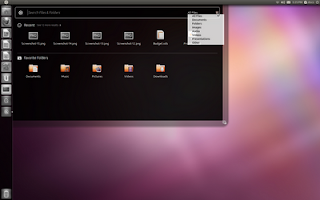 Files can be quickly searched and opened from The Dash. 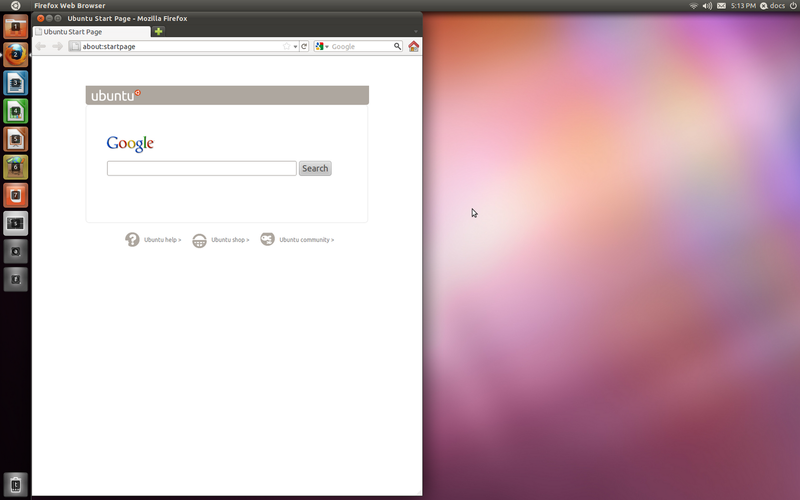 The Dash is activated by clicking on the Ubuntu logo in the top left of the screen, or by tapping on the meta key. When The Dash is activated in this way, it defaults to the Global Search lens. Commonly used applications and application categories are available by default. The Global Search lens searches applications as well as files, so applications can be quickly accessed in the same manner. To quickly open a file, typing the first few letters of the file name will show the file's icon, which can then be clicked to open. Alternatively, the icons can be navigated with the arrow keys, and typing the Enter key on the keyboard to open the selected file. The Files and Folders Lens supports browing for files. The Files and Folders Lens can be activated via the Find Files icon in the Global Lens, or by clicking on the Files and Folders Lens icon on The Launcher. This lens presents recently used files, and commonly used folders. Any of these views can be expaned using the "See more results link". Searching file title and contents is supported in the search field, producing a list of results if any matching files are found. The Files and Folders Lens also supports browsing for files by type, by choosing a type of file from the file type dropdown. Selecting a file type will produce a list of files ordered by time. While a file type is selected, search results will be limited to that file type. The Quick List for the Files and Folders Lens icon on The Launcher allows fast navigation to a file type filter in The Dash. 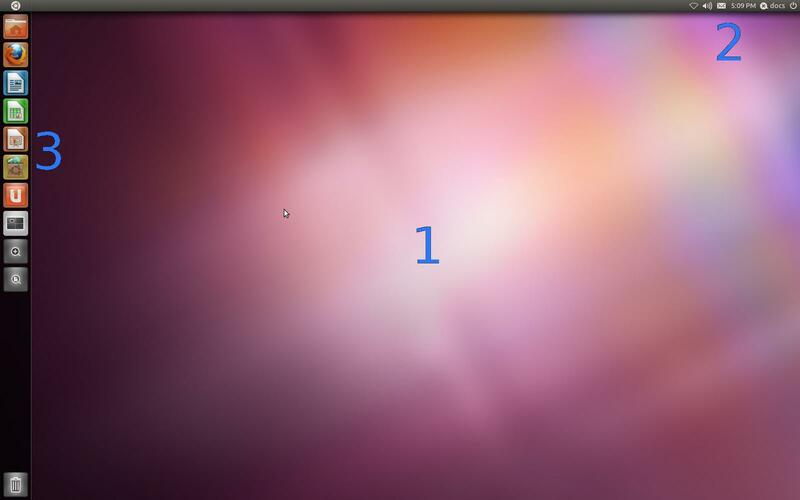 With a few exceptions (notably Libre Office) menus for an active application window will be availble on the long top panel of Unity, in the Menu Indicator. When the menus are not active, the window title will be display there. To see the menus that are available, simply hover your mouse over or near the window title, and the menus will be revealed, and you can then click on them. Alteranatively, pressing the Alt key will also review the menu for the active window, along with any available keyboard accelerators. Running applications will have one tickmark to the left of the icon for each Window that is open. In this way, it is possible to see how many windows are open for an application. 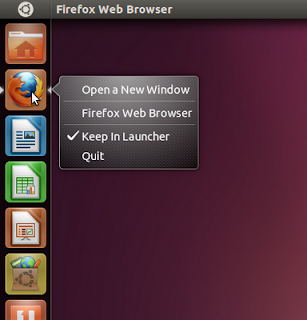 Clicking on the application's icon in The Launcher will bring the application to the foreground. 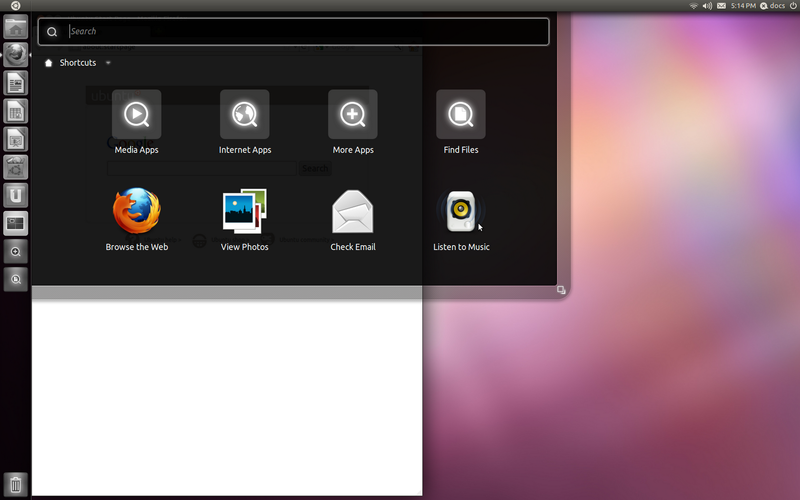 Clicking on an icon with the middle mouse button will open a new window for a running application. 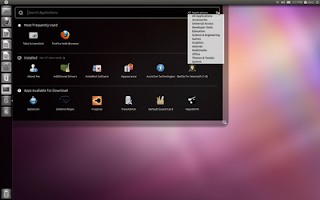 Some applications also support open a new window via a "Quick List". Right clicking on an icon will reveal the Quick List for the application. 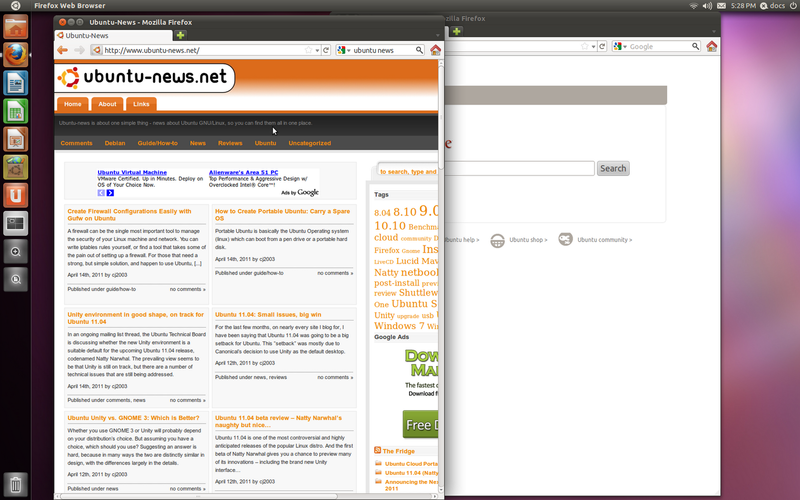 For example, Firefox has a "Open New Window" option in it's Quick List. 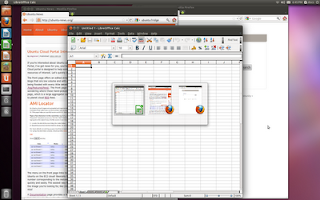 Ubuntu offers many methods for managing and switching between mulitple windows. The fastest way to switch between a window on top, and a window directly below it to hold down the Alt key, and quickly pres the Tab key. This will cause the top window to switch places with the second window. Quickly tapping Alt and Tab again will switch them back. Two windows can be alternated very quickly in this manner. 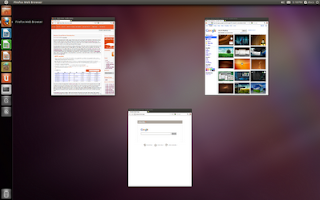 Alt and Tab can also be used to switch to a window that is not the second window. Pressing the Alt key and holding down the Tab key will quickly bring up a list of open windows. Pressing Tab will select each window in turn. Release Alt and Tab will cause the currently selected window to come to the front. 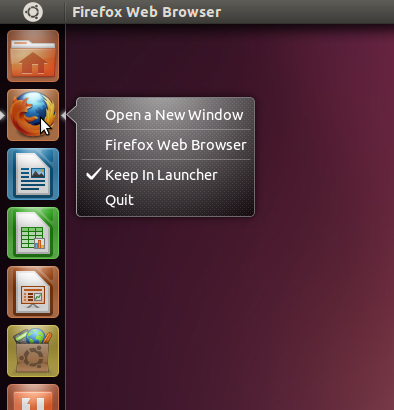 If there are mulitple windows open for a particular application, clicking on The Launcher icon for the desired application will reveal of all the windows. Clicking on the desired window will bring that window to the front. Pressing the Meta key and W will cause all open windows to be revealed, no matter the application with which they are associated. This faciliates quickly finding any application that is open, no matter the Workspace the window is on. Clicking the close button will close the current window and potentially quit the application as well. Minimize will hide the window altogether. A minimized window can be accessed by clicking on the application's icon in The Launcher, or by navigating to the window by holding down the Alt key and holding down the Tab key and then tapping the Tab key until the minimized window is selected. 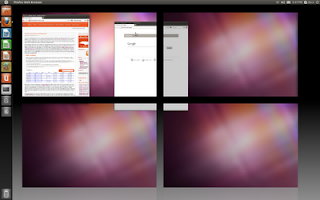 A window that takes up the whole screen is "maximized". For an unmaximized application, clicking on the maximize button will cause the window to maximize. Clicking on the maximize button for a maximized will cause the window to unmaximize. 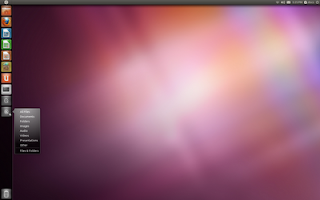 A window can also be toggled between maximized and unmaximized by double clicking on the applications titlebar. Dragging an unmaximized window's title bar to the top of the screen will maximize the windw. 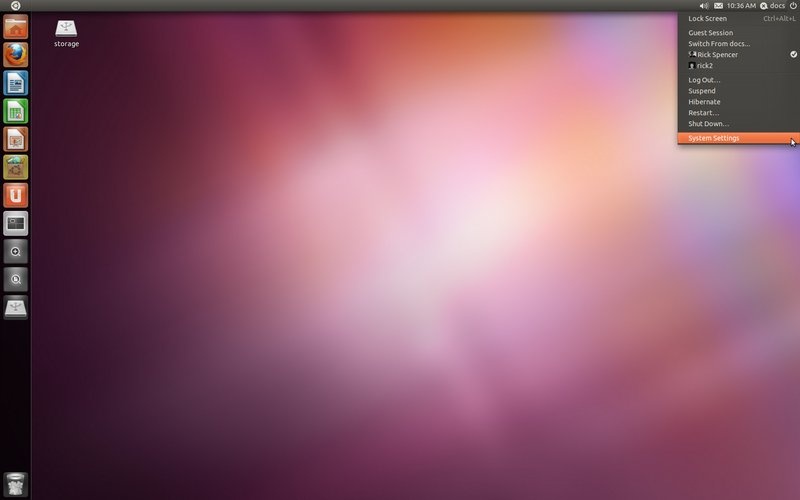 Dragging a maximized windows title bar to the center of the screen will unmaximize it. Dragging a window by the titlebar to the the right or the left of the screen untl the mouse pointer touches the edge, will resize the window to take up half of the screen. This can be useful for sizing windows and using them side by side. Workspaces provide a means for organizing windows into groups, and quickly switching between those groups. For example, windows associated with work could be grouped onto workspace 1 while windows associated with chatting with friends could be groupled onto workspace 2. By default, all applications are opened onto Workspace 1. There are four available workspaces. 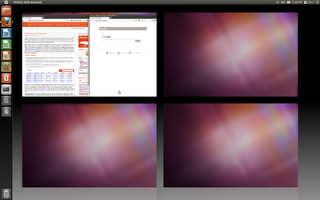 Clickng The Workspace Switcher on The Launcher provides an overview of the four workspaces, arranged in a grid. Clicking on a workspace, and then clicking on The Workspace Switcher will make that workspace the active workspace. Applications launched from The Launcher or The Dash will be open on the active workspace. 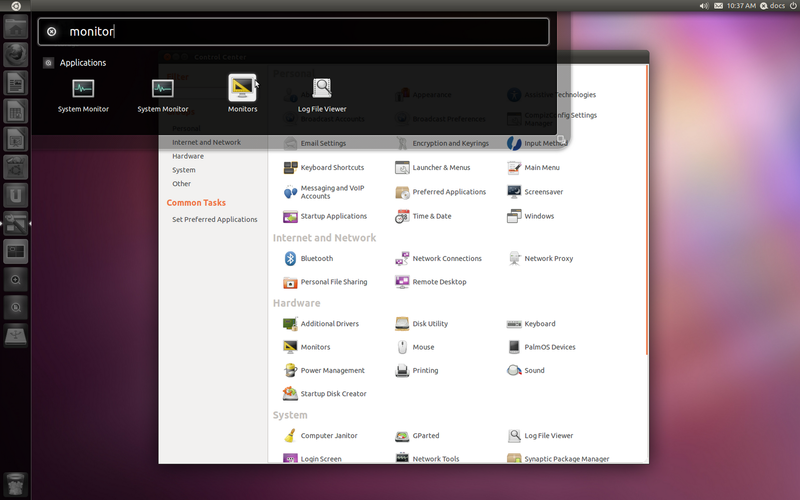 Note that clicking on an icon in The Launcher for an active application, will navigate to that application. If the application is on a different workspace, that workspace will become active. A new window for an application can be open by middle clicking on the application's icon in The Launcher, or using the Quick List for some applications. Holding down the Meta key and Clicking S is a short cut for activating The Workspace Swithcer. Holding down the Control and Alt keys, and clicking on the arrow keys very quickly navigates between workspaces. 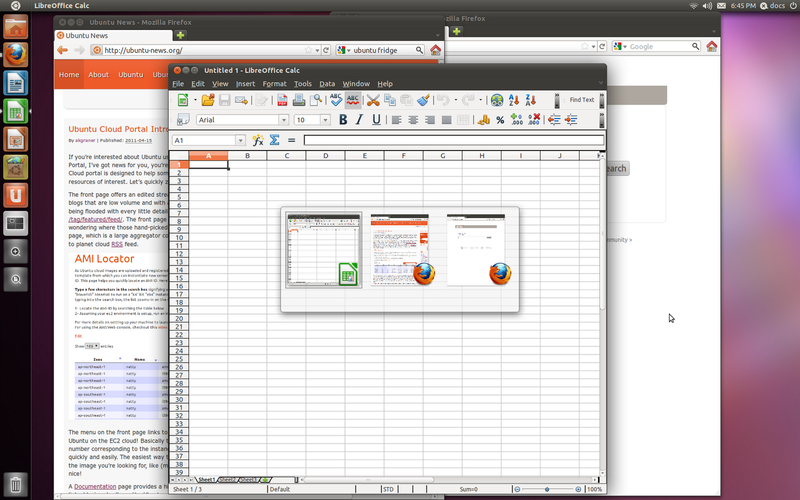 Window can be moved between workspaces while the Workspace Switcher is active by simply dragging windows between the workspaces. System Settings can be accessed via the Control Center dialog. To activate the Control Center, select System Settings from the Power Menu. You can then choose the specific settings you are interested from the list. Alternatively, you can navigate directly to the settings that you are interested from The Dash. Awesome that you did this! The Doc Team needs to make writing easier to do by taking the tools out of the equation. Use something like docuwiki, I guess, exporting to Mallard or whatever. That way, you and I could write nice articles like this without having to learn yet another markup language (that's not named YAML). Very nice to read this kind of documentation. It is to the point and I like it. You even explain what is the "meta key". Other help documents assume that one knows which is the meta key, just because there is another help document somewhere that explains it. I think that Unity could attract new users to Ubuntu, so this kind of documentation can really help them getting their feet wet with Ubuntu. - in it's Quick List. This is not a thorough list, so there may be more errors inside. However, I hope you can correct these to make this documentation even better. Thanks, one of my pet peeves with some of the new stuff that comes in Ubuntu is that it does not get documented well. In particular, I prefer to work with the keyboard, so documenting keyboard shortcuts is essential. I'm wondering if unity allows you to configure the 'meta' key. * Also, maybe a section on reorganizing the launcher icon? (press and hold the left mouse on an icon, then the icon will decouple from the launcher and you can reorganize the icon between applications). * Another suggestion: (more advanced though): showing the drag and drop support (like, drag an image on the launcher, shotwell and firefox which can handle images will desaturate. Dropping it there will make the application loading the image)? have you tried this with an extra monitor on the left side? Hi all, thanks for the feedback. I fixed the things that folks pointed out. Thank you! This changes Unity from utterly confusing to rather pleasant. "Thank you! This changes Unity from utterly confusing to rather pleasant." Great job! Put it on a wiki, quick, so we can fix typos et all. I learned a lot from here. Thank's to you. Now I can use my ubuntu again in a more efficient way than in 10.11. Before reading this, I was thinking that I was new again with linux after using it for years! Thanks a lot, from unusable unity to a bit understanding. Thanks for the article. Unity is cooler than I thought. I feel like a power user again. I'm looking forward to even more customization options in the future, but I think I can get behind it at this point. Thank you ! I found this doc very complete to introduce me on the use of Unity. I read some articles describing Unity, and I already like it, though I don't yet have it in my desk. I see it as a really new approach to the desk (I know it's not the only one, it's not that what's important). I'm upgrading Ubuntu right now. Thank you again for your effort. Regards! Would the Ubuntu Team give serious thought to developing a video for Unity at least for 11.10, and ship it as part of the install CD, or otherwise make it readily available as required viewing? Your writeup has the backbone in place for that video. Much of the negative sentiment against Unity on various fora is because it disrupts old work habits. From you excellent tutorial it is clear that this disruption is for the better. Very good Unity help !!! Unity might be very good, but it is a pain ... to everyone who as made a different and better way (than Windows) to work. Linux is future !!! 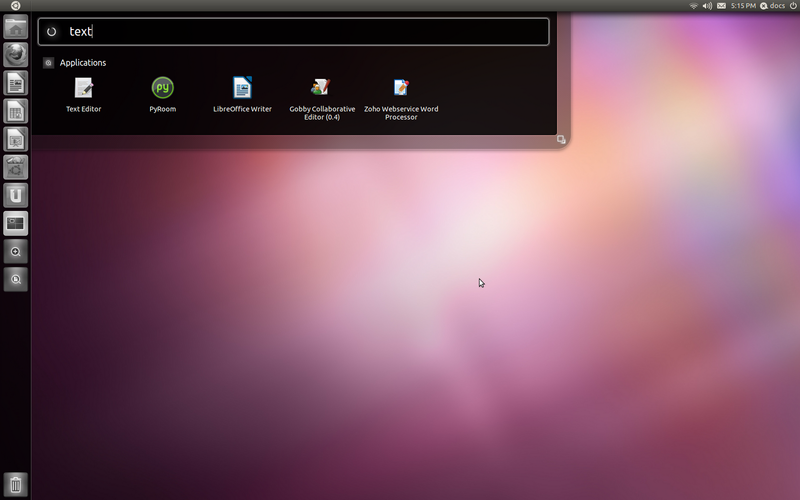 Linux rocks !!! Where is the "Any" key!!! Very nice and great article post it's also helpful information so thanks a lot for sharing us. Thank you for taking the time to post this tutorial well done and keep it going. I applied this nice and attractive system. Really great experienced and thanked to you for sharing with us. Keep it up. Not Only Great, Super great. Excellent informative post.Thanks sharing post for learner photoshop. Geat important post.Thank you so much. Really great and informative share with me. I like this good advice!! whoah, this weblog is wonderful I love studying your posts. Keep up the great work! You already know, many persons are looking around for this information, you could aid them greatly.